Sports’ Sport Psychology Videos and Podcasts! Learn cutting-edge mental game strategies from the online leader in free sports psychology videos and podcasts. Peak Performance Sports’ podcast are ideal for any athlete, coach, or sports parent that wants an introduction to sports psychology and mental game coaching. Our mental game podcasts for athletes and parents are the most popular on the internet. You can listen to the sport psychology and golf psychology and tennis psychology podcasts on our blog or iTunes sites listed below. You can also watch the most popular mental training video series we offer to the public below by subscribing to our mindset for sports channel at YouTube. In addition, to access over 700 pages of online mental training articles, videos, podcasts, and tele-seminars, visit our Online Mental Training program at Peaksports Network. Dr. Patrick Cohn, golf psychology expert and author of the “Golfer’s Mental Edge” CD and workbook program, teaches amateur to tour professional golfers how to improve their mental game of golf. 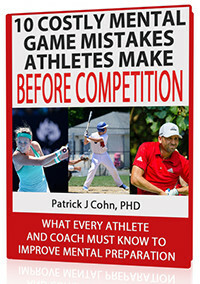 Please browse Dr. Patrick Cohn’s Golf Psychology podcasts by clicking the link below. Learn how to improve your mental game and get an introduction to golf psychology coaching. Mental game of sports expert, Dr. Patrick Cohn, answers questions from athletes, coaches, and parents on how to improve their mental game, confidence, focus, and composure for sports. He is also author of The Confident Athlete series. Listen to hundreds of sport psychology podcasts by clicking the link below. You can listen to The Sports Psychology Podcast here. Subscribe to The Sports Psychology podcast via iTunes. Mental game of tennis expert, Dr. Patrick Cohn interviews coaches, answers questions from parents and tennis players and helps them boost their confidence and deal with pressure in tennis. He is also author of the popular workbook and CD program, Tennis Confidence. Get free mental game of tennis instruction with the tennis psychology podcast. You can listen to all the Tennis Psychology Podcasts here. The Ultimate Sports Parent Radio-a series of audio interviews–offers sports parents and youth coaches tips and strategies about specific youth sports issues, which are listed below. You can listen to the audios online, download them to your computer, or use iTunes to listen to them any time. The show includes interviews with sports parents, youth sports experts, and coaches. Listeners hear other parents’ stories and get practical information about playing time, difficult coaches, kids’ worries, how to improve kids’ mental game, sports kids’ confidence, and other issues. Listen to the Ultimate Sports Parent Radio Show here. You can subscribe to the radio show on the iTunes link below. In “Mental Training Sessions with Doc,” Dr. Patrick Cohn answers your sports psychology and mental training questions in all sports for all levels. Click on contact us to submit your question for Dr. Cohn to answer in his mental game videocast or podcast! You can watch all of our Sport Psychology Videos here. Subscribe to my Sport Psychology Videos on YouTube. Do you have a mental game question you would like us to answer? We promise to read your mental toughness question and respond, but we can’t guarantee that your question will be answered in one of our sports psychology podcast.